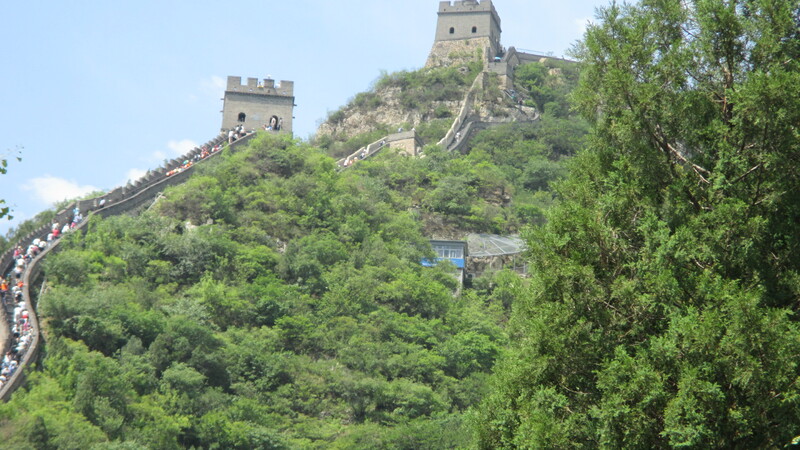 My visit to the Great Walls of China in June, last year, leaves me with a striking note that significantly changes my view about historical remains: while their gigantic, magnificent architectures have always been everlasting magical objects, they, too, provide samples on super ambitious, very ruthless, highly selfish human traits of all. I have read that the reason we learn about history is that we can take lessons from previous civilizations. I take the saying for granted until I visit the Great Walls of China. I do go to the Borobudur temple when I was a little kid with my family but the Great Walls of China completely wows me. I’d like to compare a bit between the two. If anything is mistaken please have a mercy on me. I compose this post according to all of the stories, articles that I have read so far. Comparing the purposes of the two artefacts, the Borobudur temple conveys more logics to be built upon. It serves for religious purposes even it remains as a center for Buddists during ceremony in Indonesia until now besides as a tourist attraction. It contains so many philosophies in Buddha that tells wisdom about human beings. While the Great Walls of China is for defense system. It helps the Chinese to counter attacks from the Mongolians. As such, the Great Walls stretches alongside the hills of the northern part of China. Its buildings go in accordance with the hills, few parts of the Great Walls are on the flat surface yet most of them lay on the higher ground, some are even on the uppermost of the hills. Definitely, one can see very different construction process regarding both. While the Borobudur temple lies in square, flat area, the Great Walls, on the other hand, undergoes much more complicated ways (see pictures) given its ascending contour. What I am trying to say is that despite the fact that both are world’s two wonders, the Borobudur temple makes more sense to me, in terms of the purposes and the establishment. Although scientists remain doubtful on how the ancestors place giant rocks in such a way that they are turned into high, neat, symmetrical construction, I myself think the Great Walls are beyond my logic. I think it is almost impossible to be done by people at that time when modern science is still far from existence. The core issue that strikes me the moment I come to the Great Walls area is the height of the hills. How do the Chinese, at that time, put the rocks in accordance with the height? How come they do that? While until now I am still confused on the establishment process I force myself to believe that anything may happen when about one million people within decades work on that (my Chinese local tour guide tells me about the number). Whether they use wooden stairs to climb the hills then put a rock one by one or they use ropes to place the stone… again, when around one million Chinese are forced to complete the project, anything can happen. Big numbers is miraculous factor in this case, which, I think justifies my first premise in the beginning of this post: super ambitious. Then, let me add the story from the local guide tour who says the mega super long project has claimed the lives of so many Chinese that there is even a folklore that is taught in schools about a woman who loses her husband after he is forced to work in the Great Walls. Unverified story has it that the woman agrees to be the wife of the king under one condition that the king must discover her husband’s corpse then buries it properly. After the king grants her wishes the woman instead commits suicide. The local guide tour says the story is untrue but regardless of that I think the idea of the folkore is to show how cruel the Chinese governments at that time that they drag their citizens to even sacrifice their lives to complete the project. Whereas the Great Walls is an instance of humans’ ambition, so far nothing can beat the symbol of selfishness as seen in the construction of pyramids in Egypt. In spite of the brutality in the making of the Great Walls I can still wholly accept that it is for the sake of the China’s security; that the administration wants to protect its people. But pyramids prove that the Egyptians, especially the Pharaohs, are indeed the most selfish kings of all as they enslave their people to create the super big constructions as their cemetery for either their corpses or wealth. I have yet to visit the pyramids but given its super tall and huge images and all articles that I have read related to their aims, I can’t imagine the sufferings of the people who work on the pyramids, which, unfortunately, are for the sake of the rulers’ interests only. While the medium where which the pyramids are built upon is less complicated as that of the Great Walls (in my humble opinions), I am so astonished and lost for words to explain my feelings about the pyramids. The remains are indeed stunning but what lay behind them are shocking and bleak. I guess there’s no gain without any pain. In order to create world’s most outstanding constructions, ordinary citizens have to carry the burden of making their rulers’ personal dreams into realizations, with some are for people’ interests, too. For me, looking back at the past teaches me a lot not only about old people’ skills, brilliancy, but also about their moral traits as human beings; that sometimes their worst sides yield remarkable constructions that mirror ancient achievements through miseries, bloods and sacrifices. Alhamdulillahirobbil’alamin (thank Alloh swt) I am not one of the common people living in those era.